Martin Slevin scored Racing Club's third at Coventry Copsewood. Racing Club Warwick moved up to fourth in Midland League Division One, three points behind leaders Bromsgrove Sporting after a 3-1 win at Coventry Copsewood, avenging their cup defeat four weeks earlier in the process. 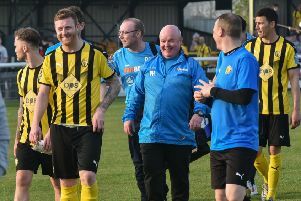 Copsewood have been Racers’ bogey side in recent seasons and that run looked set to continue when a cast-iron penalty was waved away after Wade Malley was scythed down and Jamie Smith and Joseph Wright both spurned one-on-ones. Smith soon made amends when Wright set him up to fire home the opener. Racing Club continued to play good football with Alex Price and Martin Slevin pulling the strings and Smith causing a major headache to the home left-back but they were unable to add to their tally before the break as Copsewood disrupted play with a series of niggly fouls. Racing Club were back on the front foot after the break and Brown fired at the keeper after a mazy run. They doubled their advantage in the 53rd minute after Malley was upended in the box, Smith coolly converting from the penalty spot. A few minutes later, Slevin dropped a shoulder to beat two men and his shot looped off a defender’s leg to beat the keeper and put the game out of the reach of Copsewood. The only concern now was the patchy fog and an abandonment but it stayed light enough to end the game. The hosts were reduced to ten but spoiled Racers’ clean sheet late on thanks to a free-kick from Daniel Fraser. Racing Club are without a game this weekend, returning to action on January 21 at home to Heath Hayes.